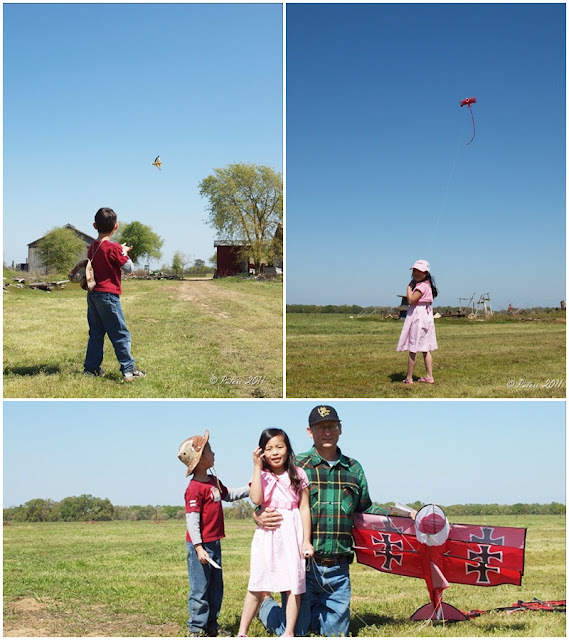 Last Sunday, right after church, we made our way to MacFarland Ranch so that we could participate in Kite Day. This year was only the second time that we'd participated! We kept missing the dates! The kids were really excited, and they got their kites ready and loaded them in the car before we left for church. The Kite Day started at 10 a.m. and I wasn't sure how many people were that before noon. When we got there after 1.00 p.m. there was not a bad crowd there. A bigger crowd would not have worked! Kites would have got entangled! For those who didn't have kites, there were kites that they could borrow there, and they even made little kites and supplied strings for anyone who wanted a kite. For my kids, it was a fun afternoon. Too bad the wind did not blow more consistently. When it did blow, the kites would stay high up in the sky, and when the wind dwindled, all the kites fell to the ground. We will try to keep an eye out for next year's event! Good thing we saw the flyer stuck to wall near the door to the kids' favorite local restaurant! That's how we learned of this year's Kite Day date!